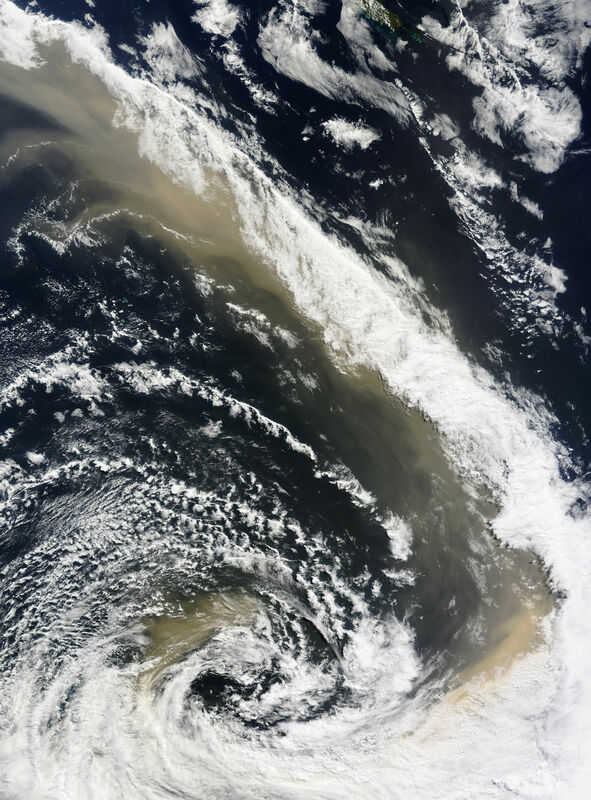 On the morning of September 24, 2009, the dense dust that had covered eastern Australia the previous day blew south over the Tasman Sea towards New Zealand. The Moderate Resolution Imaging Spectroradiometer (MODIS) on NASA’s Terra satellite captured this photo-like image of the storm on September 24, at 11:10 a.m. New Zealand time (23:10 UTC on September 23). The dust plume is still densely concentrated in this image, attesting to the strength of the winds. The plume is clearly entrained in the storm system that brought the winds to Australia in the first place. The plume underlies the storm clouds, sharing their fish-hook shape. The image covers approximately 2,300 kilometers (1,429 miles) from north to south, about the same distance from New York City to the center of Kansas in the middle of the United States. The lower half of New Caledonia Island is visible along the top edge of the image. Hidden by clouds, the northern shore of New Zealand’s South Island is outlined in the lower right corner of the image. A few hours after Terra MODIS captured this image, the MODIS instrument on the Aqua satellite observed the northern half of the plume extending along the east coast of Australia to the northern tip of Queensland’s Cape York Peninsula on September 24. The straight-line distance between the far northern edge of the plume on September 24 and the southern edge is about 3,450 kilometers (2,700 miles), roughly equivalent to the distance between New York City and Los Angeles. The large image is at MODIS’ maximum resolution of 250 kilometers per meter. The MODIS Rapid Response System provides the image in additional resolutions.